Canada is constantly ranked as one of the most naturally spectacular places in the world, being included on prestigious lists such as the Top Places To Visit by the New York Times and Lonely Planet's Best In Travel Country of the Year for 2017. And, is there a more Canadian way to enjoy this beautiful and bountiful land of wilderness and nature than camping? We don't think so! The gentle sound of a babbling creek in the distance and the stillness of the air while stargazing away from city light is magical. In the backcountry silence takes on a whole new depth. You feel a type of full body relaxation that only happens when you strip away all the small, but constant, sounds and noises of urban life. The ticking of a clock, the hum of air conditioning, colleagues typing, or cars in the distance. All gone. It's just you, your horse and the gentle sound of wind in the trees. We built our very own backcountry camping ranch in the mountains near Pemberton, BC. 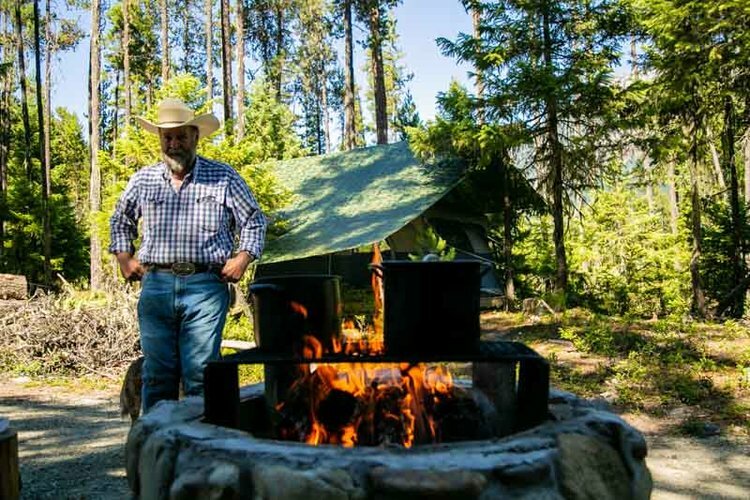 It is designed like a traditional working cowboy camp but with a few extra luxuries, like a washroom and hot shower, for guests of our horseback riding tours. It's the perfect balance of rustic wilderness and creature comforts. Guests stay for 2 nights and 3 days exploring the coast mountains, winding from the lush valley bottom to a historic sub-alpine goldmine via singletrack horse trails, hiking trails and river-crossings. The camp's location was chosen for its abundance of natural resources and the camp was almost entirely built from foraged, recycled and reused materials found locally. The timber frames were hand-built by Don, Dudley and a small team of volunteers from naturally fallen trees. Flowing past camp is a river that wafts cool air up the banks on warm summer days and there is a patch of wild berries that are just delicious on your morning pancakes. We'd live there year-round if we could, and the horses just love it up there. Doesn't that sound idyllic? All that's missing is you! Isolated bliss in the Birkenhead backcountry 🌸🌼🌲 Our boys had the day off but Duke and Gus Bus were amazing.